You're not going to Ridgewood’s Fresh Pond Mexican Restaurant & Coffee Shop for the ambiance, of which there is little to be found in its lime green walls and marsala ceiling, pre-made pastries lining the counter, and paper menu with approximately 500 items ranging from a cheeseburger "de luxe" to pozole. No, you’re here for the $3 al pastor tacos. The first good sign is the double-stacked white corn tortilla base. The chopped pork is tender and the spice mix is smoky, with a cinnamon sweetness punching through to counter the deep savory flavors. The toppings are simple: diced white onion, avocado that’s more like a salsa verde than guacamole, and cilantro, with lime wedges and radish on the side. Each taco is presented individually cradled in wax paper, the back pinched to be perfectly handheld, the insides puckering. 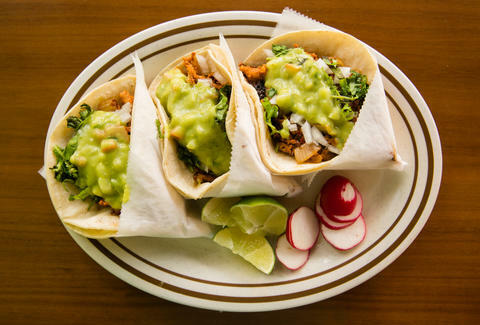 Though there are more convincing Mexican restaurants in the area (and Bushwick, a neighborhood densely packed with subversive, hole-in-the-wall Mexican spots, is down the street), the utter unpretentiousness of this place makes the standout Mexican food all the more surprising. You can get your restaurant-quality tortas and huaraches and quesadillas (or literally whatever), served with the same kind of friendly and familiar demeanor you get when you order a late-night sandwich from your bodega. Unless the dudes behind your bodega counter are mean, and in that case, I guess it's time to move to Ridgewood. Leanne Butkovic is the meanest person on her block and a Cities Editor at Thrillist. Tweet her your favorite tacos: @leanbutk.